In this holiday home with outdoor jacuzzi, you'll enjoy open space, rest, comfort, and privact. 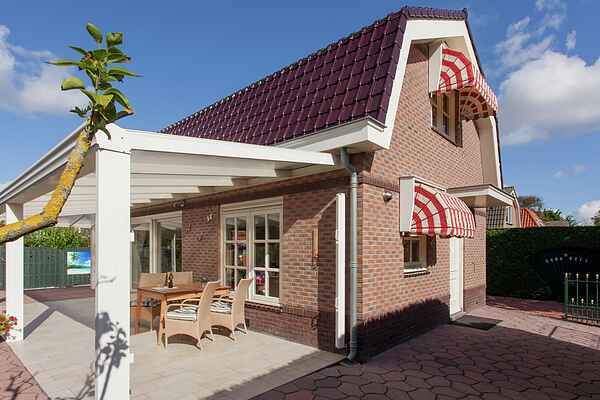 You'll be staying at a small-scale holiday estate directly behind the dunes, just outside Noordwijk aan Zee. The holiday home is completely furnished–you'll have all that you need during your stay. The two large sliding doors lead out onto the large, unique veranda. You can have a cosy meal here at the table and relax outside in the first rays of morning light. Below the veranda, there is also a large jacuzzi, which can be protected with windscreens. The large garden offers various places to sit, for instance, by the outdoor fireplace and barbecue. The children will have a great time playing on the trampoline on the lawn. The holiday home is the perfect place to start your beach holiday, of course; the dunes are practically right outside your door and, by foot or by bike, you'll be at the beach in no time. The extensive dune area almost begs for you to hike or bike through it. Noordwijk's boulevard and charming town centre can be reached in just five minutes. Cities like Haarlem, Leiden, Amsterdam, and the Hague are less than a half-hour drive away. In the spring, you can admire the exuberantly blossoming flower bulb fields. From 1st January 2017: use of jacuzzi and bathrobes included!